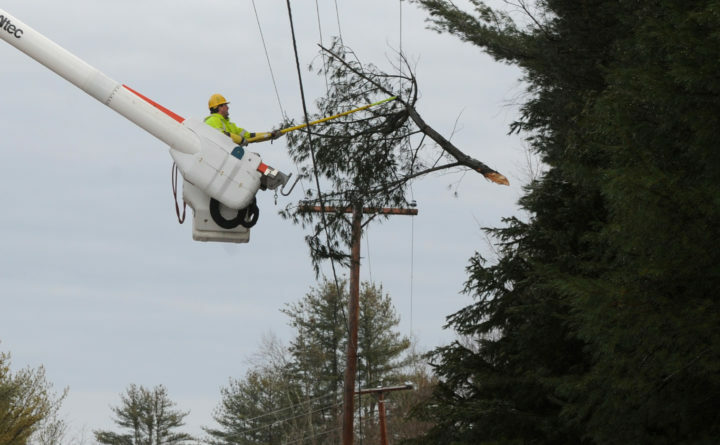 A Central Maine Power line worker removes a broken branch from a line in this BDN file photo. High winds across southern Maine caused nearly 3,000 outages at their peak, but the electric company had reduced that number to a few hundred by 11 a.m.
High winds across southern Maine knocked out power to nearly 3,000 homes Monday morning by just after 10 a.m., Central Maine Power Co. reported. But about an hour later, just after 11 a.m. Monday, outages in CMP’s coverage area had been reduced to 347, with the majority — 295 — in the state’s southernmost York County. CBS 13 Meteorologist Dustin Bonk forecast wind gusts of up to 60 miles per hour Monday, reporting a wind advisory for southern and western Maine, and high wind warning for York County. Central Maine Power said it brought in additional crews in anticipation of the outages, resulting in a quick restoration of power for most households affected. “We’ve been working since Thursday to track the course of this storm and the timing of this story particularly when the winds are going to hit and we have about 100 contract crews coming in that we’re positioning across our territory,” CMP’s Catherine Hartnett told CBS 13. Emera Maine reported just two outages in its coverage area. High winds throughout the northern and northeaster United States also caused about 600 flight cancelations, Bloomberg reported, although Portland International Jetport officials said few of the flights coming into or out of Maine’s largest airport have been affected. According to the jetport website, one afternoon arrival from Philadephia and one afternoon arrival from Washington, D.C., have been canceled, while three afternoon departures — two to Newark, New Jersey, and one to Philadelphia — have been canceled and another two delayed.